Genome sequencing projects have identified the G protein-coupled receptor (GPCR) superfamily as one of the largest classes of proteins in mammalian genomes (1). For example, preliminary analyses of the human genome have revealed up to 600 GPCRs (2,3). Additionally, GPCRs are scored as the most common family in the human proteome at the Proteome Analysis Database of the European Bioinformatics Institute(see http:// www.ebi.ac.uk/proteome/HUMAN/interpro/top15f.html), with more than 800 sequences. Based on phylogenetic analyses of the human genome, these receptors have been classified into five main families: glutamate, rhodop-sin, adhesion, frizzled/taste2, and secretin (4). the cell membrane. To perform these functions, extracellular ligand binding to the receptor is translated into regulation of the activity of intracellular proteins—primarily heterotrimeric guanine-nucleotide exchange proteins (5). In turn, these G proteins modulate several cellular signaling pathways, such as adenylyl cyclase, phopholipase C, or potassium and calcium channels. One of the most striking properties of GPCRs is the variety in the chemical nature of their cognate extracellular ligands. Different subfamilies respond to signals of great structural diversity, such as hormones, peptides, nucleotides, amino acids, neurotransmitters, lipids, ions, or light (6), all of which interact with GPCRs in distinctive binding modes (7). 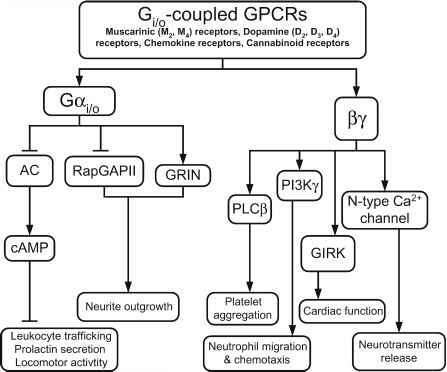 Despite such agonist diversity, activation of a GPCR invariably leads to G protein activation. Therefore, the question arises regarding how this protein family, stemming from a common ancestor, has evolved such diversity in ligand recognition while preserving a common scaffold composed of seven-trans-membrane helices (TMHs) and a set of shared intracellular partners. Because of the difficulty in producing and purifying a recombinant receptor, only one GPCR, bovine rhodopsin, has been crystallized thus far. Different analyses of X-ray diffraction data of the crystals have led to four structural models of bovine rhodopsin, which are available at the Protein Data Bank (PDB) at resolutions of 2.8 A (PDB identifiers 1F88 and 1HZX), 2.6 A (PDB identifier 1L9H ), and 2.65 A (1GZM) (9). These crystal structures show that bovine rhodopsin consists of seven-membrane-spanning a-helices joined by three cytoplasmic and three extracellular loops, with an extracellular N-terminus and a cytoplasmic C-terminus. An additional intracellular helix lies approximately parallel to the plane of the membrane, pointing away from the helical bundle. The presence of highly conserved patterns in the sequences of rhodopsin-like GPCRs and a plethora of data from biochemical and biophysical experiments indicate that the overall folding of the transmembrane bundle is conserved throughout the family. Although little is known about the details of the molecular mechanisms underlying GPCR activation, various experiments have suggested that motions of transmembrane helices are associated with this process. For example, changes in the relative orientations of the cytoplasmic ends of TMH3 and TMH6 (10,11) or the positions of TMH7 (12) and TMH2 (13) (for a review, see ref. 14) have been associated with receptor activation. These motions have been observed in different receptor subtypes and are likely to be a common feature of GPCR activation, at least for rhodopsin-like receptors. Specific interactions between a receptor and its cognate agonist typically involve the extracellular domain and/or the extracellular part of the transmembrane region of the receptor. As expected from the ligand diversity, these areas are poorly conserved throughout the GPCR family. On the other hand, there is a higher degree of sequence conservation toward the intracel-lular part of the transmembrane domain (9) in a region where helix movements have been observed during activation. Interestingly, little sequence conservation is observed in the intracellular loops, although these domains are known to be important for binding the G protein. Evolutionary pressure to diversify or modify the coupling specificity has probably favored this variability, whereas convergent evolution has most likely allowed distant receptors to couple with the same G protein (15,16). Such a sequence conservation pattern suggests a mechanistic similarity in the activation process, where the sequence conservation would parallel the functional conservation. Each receptor subfamily must have evolved specific motifs to adapt to the structural characteristics of its cognate ligands; therefore, domains involved in ligand binding must also be subfamily specific. On the other hand, with a common intracellular partner, the conformational rearrangement of the helices close to the G protein are expected to be preserved to a certain extent. Thus, conceptually, the signal transduction process can be seen as a progress from the extracellular side to the intracellular domain through conformational changes in the transmembrane bundle, which are propagated through interactions between specific residues (17). These conformational changes are more conserved as the signal progresses toward the cytoplasm and the G protein (Fig. 1). However, with the helical bundle embedded in the lipid bilayer, the sequence of the transmembrane domain is highly constrained. Therefore, it is challenging to understand how evolution has selected and adapted the similar architecture of GPCRs to recognize such a large variety of ligands while preserving common mechanisms of activation. It appears that GPCRs have accomplished this tour de force by achieving a significant degree of conformational plasticity on an otherwise preserved scaffold. We use this term to describe the structural differences within the binding site crevices among different receptor subfamilies responsible for recognition of diverse ligands. Additionally, individual receptors also feature some degree of flexibility, denoting the ability of a receptor to dynamically adapt to agonist binding and allow the conformational changes related to mechanisms of activation. Fig. 1. The highly diverse extracellular signals converge toward structurally conserved mechanisms of effector activation. Whereas the first steps of these mechanisms (Sj, S2) are specific for each subfamily, the last steps (Sn-1, Sn) share many common structural features (e.g., specific movements of the intracellular region of the TMHs). We are beginning to understand the molecular actors responsible for these properties. Careful analysis of sequences of receptor subfamilies allows us to detect motifs that could potentially be implicated in this conformational plasticity and/or flexibility. In a second step, these motifs are studied in silico using simulation techniques that reveal their structural properties. Finally, the motifs can be tested experimentally (e.g., using site-directed mutagenesis and bioassays) to identify their biological roles. This chapter focuses on work done on class A GPCRs (18) and refers to positions in the receptor sequences using the general notation of Ballesteros and Weinstein (19).